We're all encouraged to holiday at home and when you're a pet owner it can sometimes be the preferred travel option. As we launch our Pet Friendly Britain campaign, we're here to give you inspiration as you plan your pet friendly getaways. In part 1, we'll explore some of the most dog friendly beaches who will welcome you at any time of year in the South West of England. 1. 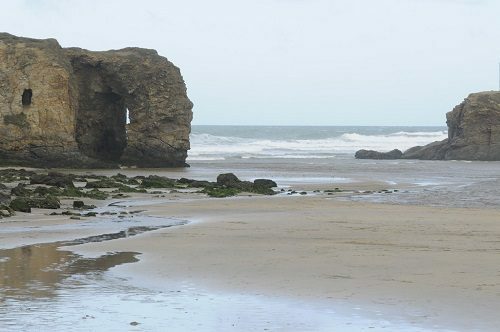 Perranporth beach in Perranporth, North Cornwall – open all year round. 2. Prussia Cove Beach near Penzance in West Cornwall – open all year round. 3. Milford-on-Sea beach near Lymington in Hampshire – open all year round. 4. Sand Bay beach near Weston Super Mare in North Somerset – open all year round. 5. Anstey’s Cove near Torquay in Devon - open all year round. 6. Mill Bay beach near Salcombe in Devon - open all year round. 7. Abbotsbury beach in Abbotsbury in Dorset – open all year round. 8. Durdle Door - East Beach near Weymouth in Dorset – open all year round. On the north Cornish coast sits Perranporth beach, with plenty of space and miles of unbroken sandy beaches to stroll along, it's said you can often feel like you're on your own. Easily accessible from Perranporth village, it's a hot spot for wildlife roaming the sand dunes and a special area of Conservation (the beach was recommended in the Marine Conservation Society Good Beach Guide last year). It's also home to a buried church! Dogs are welcome all year round, but must be on a lead during July-September. A small and secluded beach also known as Bessy's Cove. Famous as the home of a family of smugglers in the 18th century, it's beauty dates back decades. Named after one of the smugglers who was known as the King of Prussia. During periods of low tide the beauty of the small coves of sand and shingle can be seen. One of only two beaches in Hampshire without restrictions, take a stroll along the long stony beach while soaking in the views of the Isle of Wight. Once you've stretched your legs and taken in the sea air, you can stop at the cafe or ice cream kiosk to treat yourselves. This long and flat beach is popular with dog owners and horse riders alike. Often referred to as 'Weston-super-Mare's hidden gem' it's clear to see why. The dog friendly nature of this popular tourist destination is clear to see - even the open top tourist buses which take in the rest of the Weston Super Mare sights welcome dogs. Located close to Torquay, this quiet beach is a must for all crime loving dog lovers. A favourite spot of the renowned writer, Agatha Christie, it's said she often used to visit and take inspiration from the surroundings – in fact a character, or two, were named after this peaceful beach. This shingle beach is a sight to behold but access is not for the faint hearted. Access can be gained by following a steep slope and steps, although there is a hand rail to guide. Once you've visited the beach, your walk needn't end there. You can stroll along the back of the beach in the woodland area where you can watch the local wildlife go about their daily business. One of eleven all-year round dog friendly beaches in South Devon, Mill Bay beach is about 20 miles from Plymouth. This popular privately owned sandy beach is located on the east bank of Salcombe harbour, at low tide the beach stretches north to East Portlemouth beach. With rural surroundings offering additional walks to take in the sea views, beach go-ers, swimmers and wind surfers. A popular spot with keen fishermen, this gently sloping shingle beach allows you to take in the beautiful scenary stretching to Weymouth and Portland. Around a mile from the village of Abborsbury, once you're finished exploring the beach why not stop off at one of the many dog friendly pubs to rest your legs and meet the locals. Famous for its stunning Durdle Door Arch, a natural limestone arch on the Jurassic Coast near Lulworth in Dorset, this tranquil beach is a must-visit. Privately owned, it's not hard to see why this impressive beach is popular with dog owners and divers alike.